Wanna smash through your opposition with a fast paced style of football ? Abuse spaces, speed & long balls to overrun the opposition. DESTROY. THEM. ALL. Firstly, you should know that even if the tactic was tested with decent success on lesser & bigger teams, it might not work with yours depending on the players you have as it revolves strongly on the 2 Volante in the midfield. If you do, however, have all the players fitting the roles, then by all means, enjoy the show. Also, you may notice some similarities with one of Knap’s tactics. 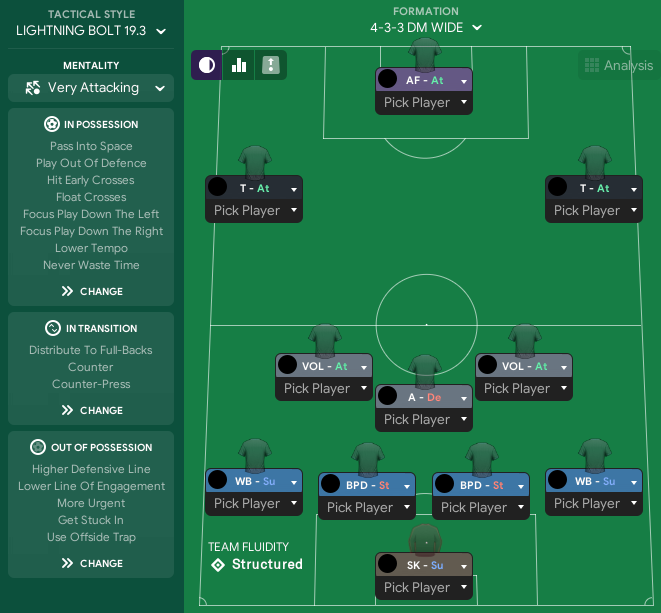 I was already working, on streams, on this tactic for quite some time when Knap’s one came out, but since we went for the same formation, I looked into it & used some parts to complete my own (Mostly the Anchor role & the overlaps instructions). 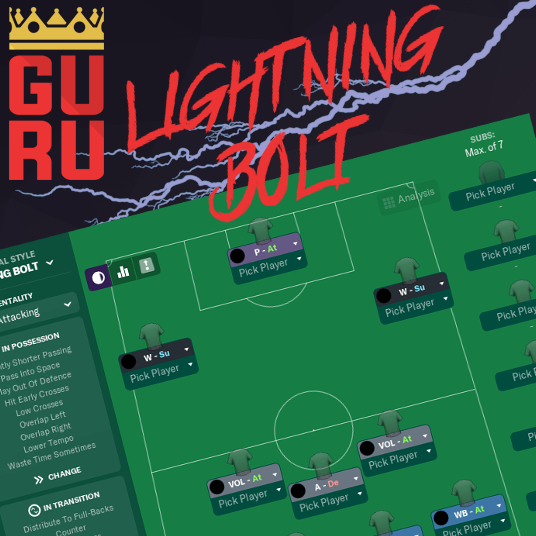 As its name suggests, Lightning Bolt is a fast paced formation that gladly gives away the possession & a huge part of the pitch in order to make an even better use of it once your players get the ball back. What to expect ? Anyone can give an assist at any point in time. The poacher makes deep runs often, & thanks to the pressing line not too high, he has the space to do so, allowing your central defenders & defensive midfields to attempt long passes behind the opposition. A pretty big part of your plays will happen on the wings, you will notice a soft spot in play between your Winger, WingBack & Volante, that often play in a short triangle in order to get rid of the opposition and make enough space for one of them to make a run for it. Most of the player profiles to look for are pretty standard. There are a few things you should look for however. Wingers : The only thing to note for wingers is that it’s alright to have a left footed player on the right wing. More often than not, if it’s their natural position, they will perform better that way. Striker : It’s always better to have someone that knows how to run, good speed is appreciated, but his Off the Ball abilities will make him shine. Bonus if he’s decent in the airs. Volante : The trickiest for the end. You can actually play various types of players as Volante, more physique oriented ones, or more technical players, or even more defensive. There are a few key attributes in my opinion to make it work in this tactic. The two most important to me are Work Rate & Tackling. If a decent 12+ Tackling will do, you might wanna look for 15+ Work Rate. After that, obviously, stamina is a big part of the player & his passing, vision will have a lot to do with his performances. Bonus if he’s good at long shots. 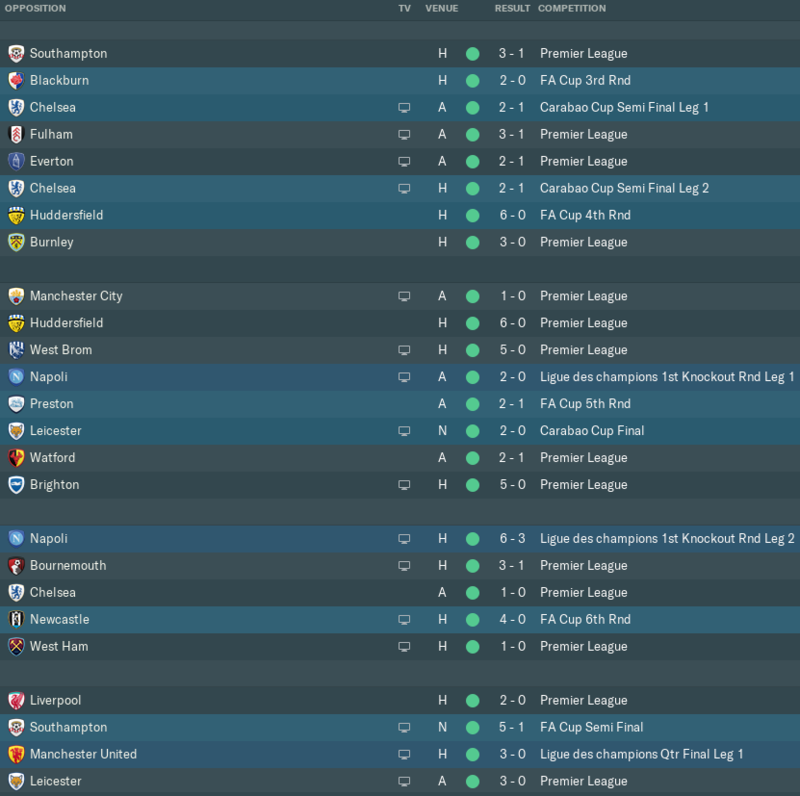 Every screenshot has been made on the first season with no transfers involved (Liverpool & Juventus was on the same save). French streamer & fan of the game ! I enjoy making tactics & fantasy databases. 38 comments have been posted so far. Yes, but as I said, latest tests (on latest patch) still show same level of results. And as you said, 19.3.4 didn't change the ME. The tactic is very good ... I play with Roma. But I noticed that by playing against big teams, I get good victories ... With weaker teams, I drew too often. @Mozes Could you please share? I want to do what you did but I am afraid I might ruin a perfectly good tactic. But at the same time I don't want to leave it as it is, because I think it might be a bit too attack minded for what I want to be my underdog tactic (which I want for CL games against much bigger opponents). Dont know if you´ll read this, but thank you. 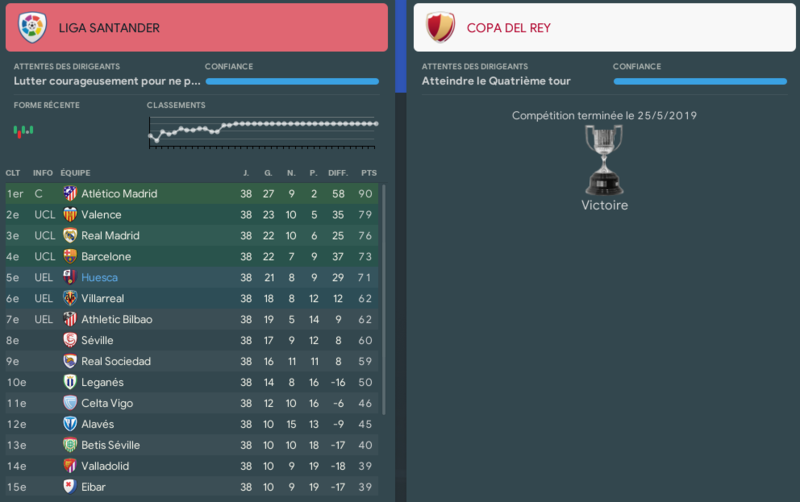 I developed a adapted version of this tactic as my "underdog" tactic with great success and I find this to be the only good, truly creative tactic created i´ve found. So take my heartfelt thanks and congratulations! @Guru can you update to 19.3 version? Thank you before. Ah, just a thing, corner taker should be the right volante for extra efficiancy. I didnt change a single thing when using this tactic. Juste have the correct players to fulfill their duties . i'm coaching Real & have to sell kroos modric James to bring in Bakayoko , Mc Rorie , Allan... Unbeaten in 47 straight games. 13 straight games without conceading a goal. 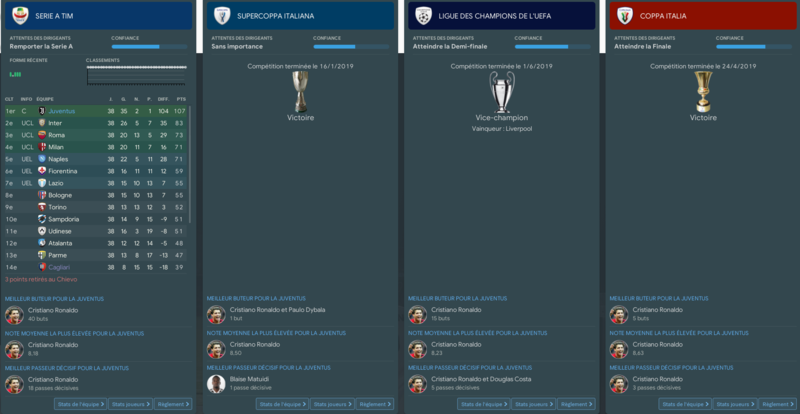 LIGA CHAMPION after 31 games. @warfare > indeed ,Kane is a complete player. Who do you have as wingers ,bcause they have to supply him with crosses . 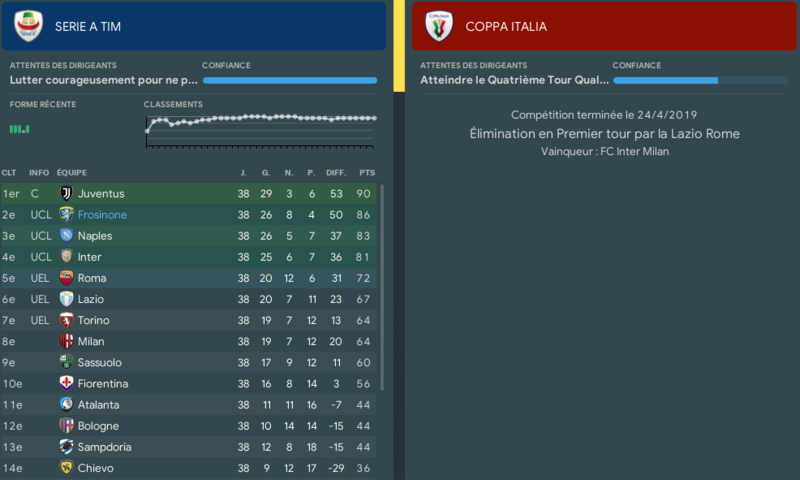 i have mbappe & depay ... And even m'y defenders (rugani & Diallo) score 10 goals in a season. Great tutorial! I'll definitely try to apply this on my next save. But, how about training? How do you prepare your players considering this tactic? 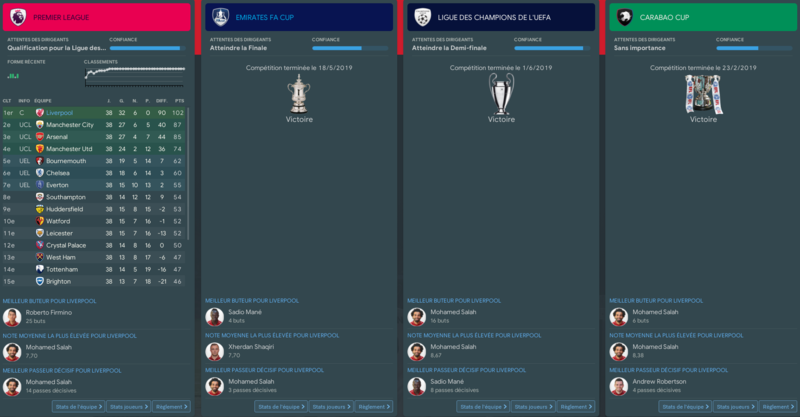 Abû Nabil Ismaïl - I have Harry Kane in the team. In 20 matches, he scored 13 goals and had 3 assists, not much. There are matches in him where he has a score of 6.20 -6.40. I do not know what to do to be more effective. @warfare> Striker : It’s always better to have someone that knows how to run, good speed is appreciated, but his Off the Ball abilities will make him shine. Bonus if he’s decent in the airs. Tactics are very cool, but my attacker has problems with gaining goals, how can this be improved? Has this tactic been tried with inside forward roles rather than just wingers? Handcrafted in Symi, Hellas. Page created in 0.627 seconds.